In anticipation of the large number of aircraft operating to and from areas hosting major sporting and entertainment events, the FAA has published updated procedures in its January 31, 2019 NOTAM to enhance safety and minimize air traffic delays. Official airport, navigation and chart data for the FAA's 28-day AIRAC cycle beginning 01/31/2019 became current today as of 09:01Z. This includes updated georeferenced data for airport diagrams and instrument approach procedures available in iFlightPlanner for iPad. 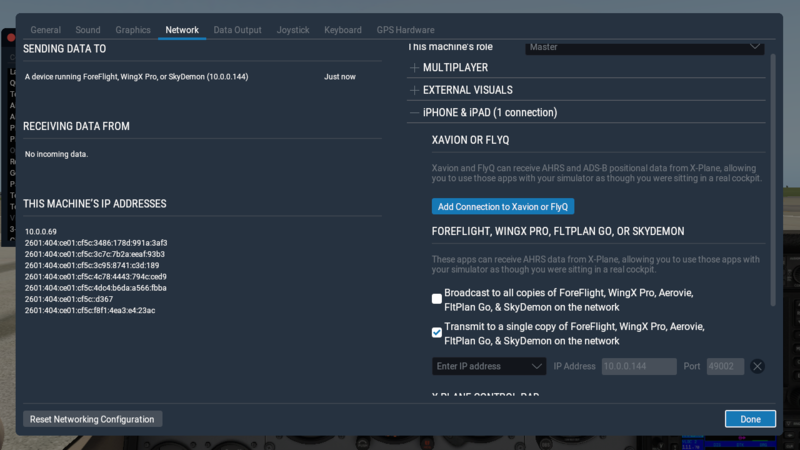 iFlightPlanner for iPad users may now download airport and navigation data as well as aeronautical charts, georeferenced airport diagrams and terminal procedures for the FAA Data Cycle that goes into effect on January 31, 2019. Simply tap the button in the upper-left corner of the Downloads tab to "Check For Updates". Pilots using iFlightPlanner.com on their desktop, laptop, or smartphone will see the iFlightPlanner Cloud automatically make the transition to the new data at 9:01Z on January 31. In anticipation of the large number of aircraft operating to and from areas hosting major sporting and entertainment events, the FAA has published updated procedures in its January 3, 2019 NOTAM to enhance safety and minimize air traffic delays. Official airport, navigation and chart data for the FAA's 56-day AIRAC cycle beginning 01/03/2019 became current today as of 09:01Z. This includes updated georeferenced data for airport diagrams and instrument approach procedures available in iFlightPlanner for iPad. In anticipation of the large number of aircraft operating to and from areas hosting major sporting and entertainment events, the FAA has published updated procedures in its November 8, 2018 NOTAM to enhance safety and minimize air traffic delays. Official airport, navigation and chart data for the FAA's 56-day AIRAC cycle beginning 11/08/2018 became current today as of 09:01Z. This includes updated georeferenced data for airport diagrams and instrument approach procedures available in iFlightPlanner for iPad. In anticipation of the large number of aircraft operating to and from areas hosting major sporting and entertainment events, the FAA has published updated procedures in its October 11, 2018 NOTAM to enhance safety and minimize air traffic delays. Official airport, navigation and chart data for the FAA's 28-day AIRAC cycle beginning 10/11/2018 became current today as of 09:01Z. This includes updated georeferenced data for airport diagrams and instrument approach procedures available in iFlightPlanner for iPad. 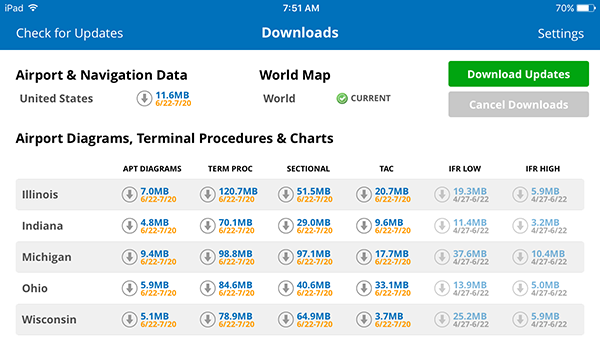 iFlightPlanner for iPad users may now download airport and navigation data as well as aeronautical charts, georeferenced airport diagrams and terminal procedures for the FAA Data Cycle that goes into effect on October 11, 2018. Simply tap the button in the upper-left corner of the Downloads tab to "Check For Updates". Pilots using iFlightPlanner.com on their desktop, laptop, or smartphone will see the iFlightPlanner Cloud automatically make the transition to the new data at 9:01Z on October 11. Official airport, navigation and chart data for the FAA's 56-day AIRAC cycle beginning 9/13/2018 became current today as of 09:01Z. This includes updated georeferenced data for airport diagrams and instrument approach procedures available in iFlightPlanner for iPad. Register for EAA's Webinar featuring iFlightPlanner! Join private pilot and iFlightPlanner Co-Founder, Andy Matthews, on Wednesday at 8pm EDT as he demonstrates the intuitive flight planning features and two-way sync capabilities of iFlightPlanner.com and iFlightPlanner for iPad! Click graphic for FREE access to interactive charts and weather! This FAA WINGS Credit webinar will show you how to use iFlightPlanner's digital charts and high resolution weather imagery, certified weather briefs, integrated weight and balance calculations, ICAO flight plan filing, and wireless two-way sync capabilities with iFlightPlanner for iPad. In addition, Andy will share how EAA members can receive an exclusive, attendee-only discount on iFlightPlanner Premium memberships and maximize this powerful, integrated EFB! Please contact us should you have any questions! iFlightPlanner for iPad users may now download airport and navigation data as well as aeronautical charts, georeferenced airport diagrams and terminal procedures for the FAA Data Cycle that goes into effect on August 16, 2018. Simply tap the button in the upper-left corner of the Downloads tab to "Check For Updates". Pilots using iFlightPlanner.com on their desktop, laptop, or smartphone will see the iFlightPlanner Cloud automatically make the transition to the new data at 9:01Z on August 16. Official airport, navigation and chart data for the FAA's 56-day AIRAC cycle beginning 7/19/2018 became current today as of 09:01Z. This includes updated georeferenced data for airport diagrams and instrument approach procedures available in iFlightPlanner for iPad. 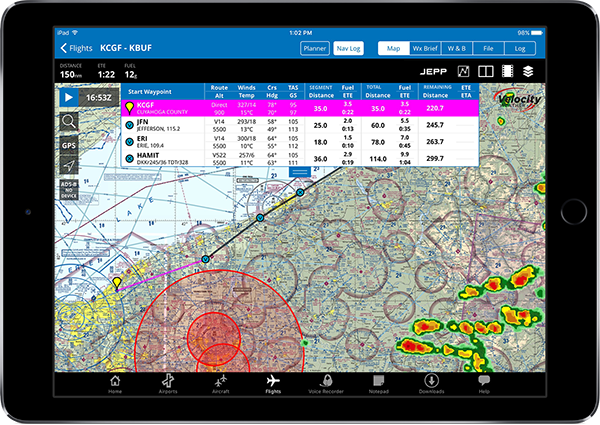 iFlightPlanner for iPad users may now download airport and navigation data as well as aeronautical charts, georeferenced airport diagrams and terminal procedures for the FAA Data Cycle that goes into effect on July 19, 2018. Simply tap the button in the upper-left corner of the Downloads tab to "Check For Updates". Pilots using iFlightPlanner.com on their desktop, laptop, or smartphone will see the iFlightPlanner Cloud automatically make the transition to the new data at 9:01Z on July 19. Official airport, navigation and chart data for the FAA's 56-day AIRAC cycle beginning 5/24/2018 became current today as of 09:01Z. This includes updated georeferenced data for airport diagrams and instrument approach procedures available in iFlightPlanner for iPad. 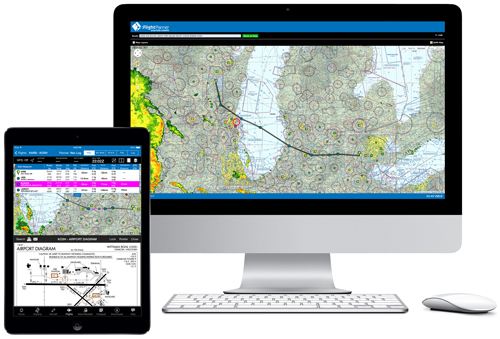 iFlightPlanner for iPad users may now download airport and navigation data as well as aeronautical charts, georeferenced airport diagrams and terminal procedures for the FAA Data Cycle that goes into effect on April 26, 2018. Simply tap the button in the upper-left corner of the Downloads tab to "Check For Updates". Pilots using iFlightPlanner.com on their desktop, laptop, or smartphone will see the iFlightPlanner Cloud automatically make the transition to the new data at 9:01Z on April 26. Official airport, navigation and chart data for the FAA's 56-day AIRAC cycle beginning 3/29/2018 became current today as of 09:01Z. This includes updated georeferenced data for airport diagrams and instrument approach procedures available in iFlightPlanner for iPad. iFlightPlanner for iPad users may now download airport and navigation data as well as aeronautical charts, georeferenced airport diagrams and terminal procedures for the FAA Data Cycle that goes into effect on March 29, 2018. Simply tap the button in the upper-left corner of the Downloads tab to "Check For Updates". Pilots using iFlightPlanner.com on their desktop, laptop, or smartphone will see the iFlightPlanner Cloud automatically make the transition to the new data at 9:01Z on March 29. We are excited to introduce an all-new Dynamic Fuel Finder and Custom Airspace Tool today, both the result of a soon-to-be-released overhaul of our web planning platform... Click any of the screenshots below for access to our freely accessible aviation charts interface at www.iFlightPlanner.com/AviationCharts to try them out! Use the Dynamic Fuel Finder to identify the best fuel prices around any location, and quickly add that airport to your trip with just a few clicks! All prices are color-coded using the same algorithm used in our Graphical Fuel Price Map Layers that were highlighted in iFlightPlanner's 4 Tools to Help Burn Less Fuel and Fly Faster tutorial. Start by clicking the fuel tank icon in the footer of the Location menu. iFlightPlanner will search and display all airports within a 75nm radius of your chosen location, whether it's along a route you've already planned or in the vicinity of your next destination. Clicking a fuel price will reveal that facility's Airport Fuel menu with details about the airport and the pricing offered by each FBO. To add the airport to your route, simply click the green, "Add To Route" button and you'll be on your way! 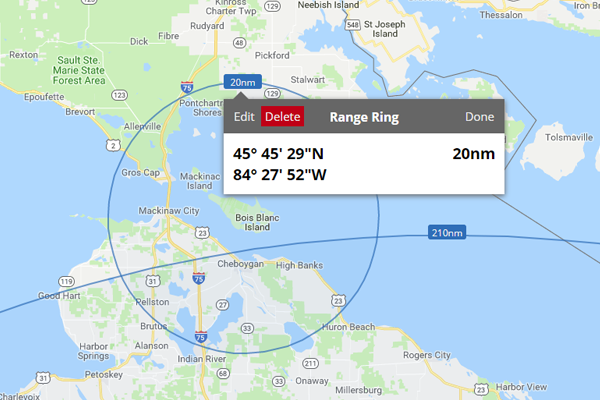 The all-new airspace tool gives you the ability to add custom range rings or circular airspace of any size, around any location, airport, or navaid, with user-defined altitude limits! 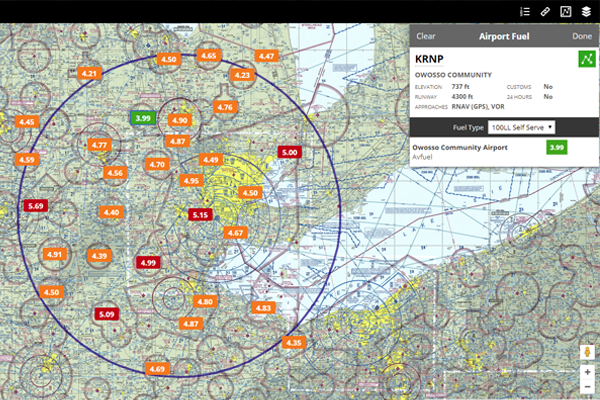 Each range ring can be set to display during all planning sessions, for a particular trip, or for a specific flight only. 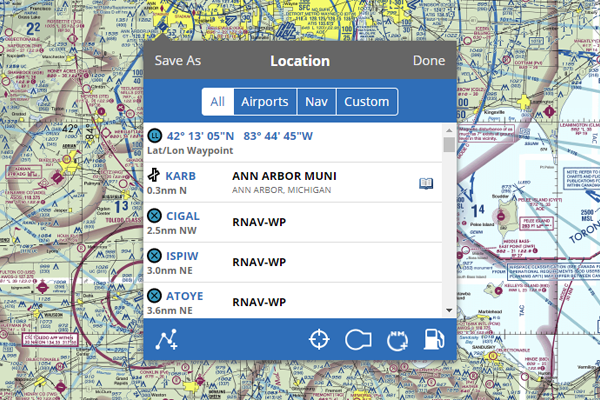 This feature is perfect for UAS operators wanting to identify their center of operations just as it is for general aviation pilots in search of fun destinations within the range of their aircraft! The Custom Airspace Tool is accessed by clicking the icon to the left of the fuel tank. 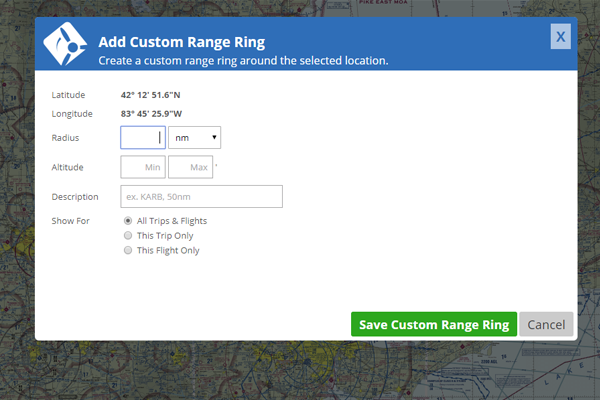 Simply enter the radius, altitude limits, and a name or description, and click "Save Custom Range Ring." To edit or delete an existing range ring, click on the label as shown here. The Location Menu, which is where steps to use the new Dynamic Fuel Finder and Custom Airspace Tool begin, is accessed by a single click in any of iFlightPlanner's web-based mapping interfaces. This redesign allows us to add other location-based enhancements in the future, so stay tuned! If you have any questions about these new features, or have an idea for a new one you would like to see added to iFlightPlanner, please contact us! iFlightPlanner for iPad users may now download airport and navigation data as well as aeronautical charts, georeferenced airport diagrams and terminal procedures for the FAA Data Cycle that goes into effect on March 1, 2018. Simply tap the button in the upper-left corner of the Downloads tab to "Check For Updates". Pilots using iFlightPlanner.com on their desktop, laptop, or smartphone will see the iFlightPlanner Cloud automatically make the transition to the new data at 9:01Z on March 1. Official airport, navigation and chart data for the FAA's 56-day AIRAC cycle beginning 2/1/2018 became current today as of 09:01Z. This includes updated georeferenced data for airport diagrams and instrument approach procedures available in iFlightPlanner for iPad. iFlightPlanner for iPad users may now download airport and navigation data as well as aeronautical charts, georeferenced airport diagrams and terminal procedures for the FAA Data Cycle that goes into effect on February 1, 2018. Simply tap the button in the upper-left corner of the Downloads tab to "Check For Updates". Pilots using iFlightPlanner.com on their desktop, laptop, or smartphone will see the iFlightPlanner Cloud automatically make the transition to the new data at 9:01Z on February 1. Official airport, navigation and chart data for the FAA's 28-day AIRAC cycle beginning 1/4/2018 became current today as of 09:01Z. This includes updated georeferenced data for airport diagrams and instrument approach procedures available in iFlightPlanner for iPad. iFlightPlanner for iPad users may now download airport and navigation data as well as aeronautical charts, georeferenced airport diagrams and terminal procedures for the FAA Data Cycle that goes into effect on January 4, 2018. Simply tap the button in the upper-left corner of the Downloads tab to "Check For Updates". Pilots using iFlightPlanner.com on their desktop, laptop, or smartphone will see the iFlightPlanner Cloud automatically make the transition to the new data at 9:01Z on January 4. Official airport, navigation and chart data for the FAA's 56-day AIRAC cycle beginning 12/07/17 became current today as of 09:01Z. This includes updated georeferenced data for airport diagrams and instrument approach procedures available in iFlightPlanner for iPad. iFlightPlanner for iPad users may now download airport and navigation data as well as aeronautical charts, georeferenced airport diagrams and terminal procedures for the FAA Data Cycle that goes into effect on December 7, 2017. Simply tap the button in the upper-left corner of the Downloads tab to "Check For Updates". Pilots using iFlightPlanner.com on their desktop, laptop, or smartphone will see the iFlightPlanner Cloud automatically make the transition to the new data at 9:01Z on December 7. Official airport, navigation and chart data for the FAA's 28-day AIRAC cycle beginning 11/09/17 became current today as of 09:01Z. This includes updated georeferenced data for airport diagrams and instrument approach procedures available in iFlightPlanner for iPad. Anytime you access iFlightPlanner.com from your PC or smartphone you can be confident that you are seeing the most current and accurate data available. To ensure that iFlightPlanner for iPad is current, simply tap "Check for Updates" in the upper-left corner of the Downloads tab. The app will quickly tell you which packages need to be updated! iFlightPlanner for iPad users may now download airport and navigation data as well as aeronautical charts, georeferenced airport diagrams and terminal procedures for the FAA Data Cycle that goes into effect on November 9, 2017. Simply tap the button in the upper-left corner of the Downloads tab to "Check For Updates". Pilots using iFlightPlanner.com on their PC or smartphone will see the iFlightPlanner Cloud automatically make the transition to the new data at 9:01Z on November 9. Official airport, navigation and chart data for the FAA's 56-day AIRAC cycle beginning 10/12/17 became current today as of 09:01Z. This includes updated georeferenced data for airport diagrams and instrument approach procedures available in iFlightPlanner for iPad. iFlightPlanner for iPad users may now download airport and navigation data as well as aeronautical charts, georeferenced airport diagrams and terminal procedures for the FAA Data Cycle that goes into effect on October 10, 2017. Simply tap the button in the upper-left corner of the Downloads tab to "Check For Updates". Pilots using iFlightPlanner.com their PC or smartphone will see the iFlightPlanner Cloud automatically make the transition to the new data at 9:01Z on October 10.
iFlightPlanner for iPad users may now download airport and navigation data as well as aeronautical charts, georeferenced airport diagrams and terminal procedures for the FAA Data Cycle that goes into effect on September 14, 2017. Simply tap the button in the upper-left corner of the Downloads tab to "Check For Updates". Pilots using iFlightPlanner.com their PC or smartphone will see the iFlightPlanner Cloud automatically make the transition to the new data at 9:01Z on September 14. Official airport, navigation and chart data for the FAA's 56-day AIRAC cycle beginning 8/17/17 became current today as of 09:01Z. This includes updated georeferenced data for airport diagrams and instrument approach procedures available in iFlightPlanner for iPad. With the August 17 AIRAC cycle, pilots will find revised Standard Instrument Departure (SID) charts easier to read because the FAA is removing the takeoff obstacle notes from them. iFlightPlanner for iPad users may now download airport and navigation data as well as aeronautical charts, georeferenced airport diagrams and terminal procedures for the FAA Data Cycle that goes into effect on August 17, 2017. Simply tap the button in the upper-left corner of the Downloads tab to "Check For Updates". Pilots using iFlightPlanner.com their PC or smartphone will see the iFlightPlanner Cloud automatically make the transition to the new data at 9:01Z on August 17.
iFlightPlanner for iPad users may now download airport and navigation data as well as aeronautical charts, georeferenced airport diagrams and terminal procedures for the FAA Data Cycle that goes into effect on July 20, 2017. Simply tap the button in the upper-left corner of the Downloads tab to "Check For Updates". Pilots using iFlightPlanner.com their PC or smartphone will see the iFlightPlanner Cloud automatically make the transition to the new data at 9:01Z on July 20. Official airport, navigation and chart data for the FAA's 56-day cycle beginning 6/22/17 became current today as of 09:01Z. This includes updated georeferenced data for airport diagrams and instrument approach procedures available in iFlightPlanner for iPad.